INSaFLU (“INSide the FLU”) is a bioinformatics free web-based suite that deals with primary data (reads) towards the automatic generation of the output data that are actually the core first-line “genetic requests” for effective and timely influenza laboratory surveillance (e.g., type and sub-type, gene and whole-genome consensus sequences, variants annotation, alignments and phylogenetic trees). Data integration is continuously scalable, fitting the need for a real-time epidemiological surveillance during the flu epidemics. The INSaFLU bioinformatics pipeline currently consists of 6 core steps (see Figure). For more details about INSaFLU, please read Borges V, Pinheiro M et al. Genome Medicine (2018) 10:46. A detailed tutorial of INSaFLU usage, as well as documentation about the current software settings and versions, is provided here. This first step automatically analyzes and improves the quality of the uploaded raw sequencing data (reads). It generates improved NGS data and graphical quality control reports. INSaFLU automatically detects the influenza type and sub-type/lineage of each sample upon data submission. This typing data guides the subsequent downstream module and constitutes an optimal complement to the traditional real-time RT-PCR assays, as INSaFLU is able to discriminate all currently defined 18 hemagglutinin subtypes, 11 neuraminidase sub-types and influenza B lineages. This module provides the first-line "genetic data" for seasonal influenza laboratory surveillance, i.e. the list of variants (SNPs and indels) and their effect at protein level and also consensus sequences (at both the locus and whole-genome levels). The latter constitutes the whole basis for the downstream phylogenetic inferences driving the continuous tracking of influenza temporal/geographical spread. INSaFLU automatically provides a deep analysis of the vertical and horizontal coverage per sample (for each amplicon), by generating several coverage statistics and also graphical plots of the fluctuation of the depth of coverage throughout each amplicon region. This step enables the inspection of the technical success and the potential unveiling of relevant genetic events, such as reassortment or homologous recombination. INSaFLU dynamically builds ready-to-explore nucleotide/amino acid sequence alignments and phylogenetic trees at both locus and whole-genome scale. These outputs are automatically re-build and updated as more samples are added to user-restricted INSaFLU projects, making continuous data integration completely flexible and scalable. Alignments and trees can be explored in situ or through multiple compatible downstream applications for fine-tune data analysis. Influenza evolution has historically been inferred from consensus sequences representing the dominant virus lineage within each infected host at a particular instant, which has limited our knowledge on intra-patient virus population diversity and transmission dynamics. In this context, INSaFLU additionally provides the user the possibility to get insight on the influenza intra-patient sub-population dynamics by the scrutiny and annotation of minor intra-host single nucleotide variants (iSNVs). INSaFLU also automatically flags samples as “putative mixed infections” if more than one type, HA / NA subtype or lineage is detected or if the population admixture enrolls influenza viruses presenting clearly distinct genetic backgrounds (e.g., mixed infection with distinct same-subtype viruses). INSaFLU is under active development in order to have additional features, such as modules to automatically detect virus reassortment and to perform temporal and geographical data integration and visualization. INSaFLU now published in Genome Medicine. INSaFLU provides a draft de novo assembly. INSaFLU now provides a draft de novo assembly of the influenza virus genome. Assembled contigs are assigned both to the corresponding viral segments and to a close related reference influenza virus. Explore it! The first release of INSaFLU was available for the flu community. 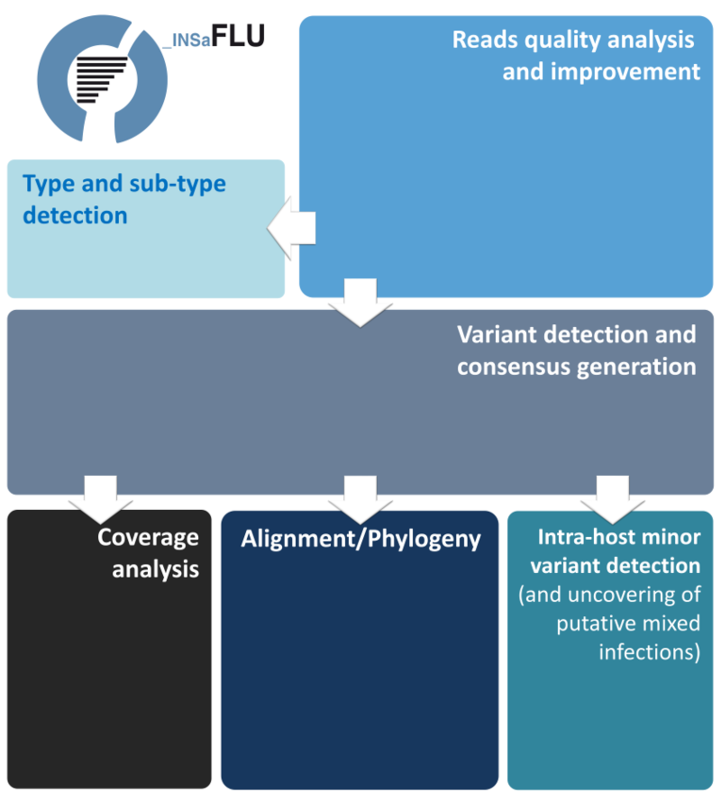 This platform supplies public health laboratories and influenza researchers with an open “one size fits all” bioinformatics framework that potentiates a global WGS-based flu surveillance. Pipeline developed by Vítor Borges and Miguel Pinheiro. The INSaFLU portal and its associated resources and outputs are for research, educational and informational purposes only, not for commercial use. It is a non-profit service to the scientific community. In any case, the name of INSaFLU and its logo shall not be associated with business promotion without prior written approval. This portal contains links to external third-party websites. INSaFLU team has not reviewed the contents of these third-party websites and makes no warranty of any kind, expressed or implied, regarding these websites. INSaFLU does not own, monitor, operate or moderate these third-party websites. INSaFLU team will not use any data submitted to INSaFLU for research, educational, informational, clinical, commercial or any other purpose. INSaFLU makes no warranties of any kind regarding the accuracy of any data, software and/or database. The INSaFLU team is responsible for maintaining and updating the content of INSaFLU. However, INSaFLU team makes no representation or warranty regarding results obtained from using any information, tools or services offered by INSaFLU. In case of unexpected issues, unexpected disruption, force majeure and similar events, such as: unauthorized or accidental destruction of data; accidental loss; technical faults; forgery, theft or unlawful use; unauthorized alteration, copying, access or other unauthorized processing and the like; violation or circumvention of any safety program or the introduction of advertisements containing codes or malware, spyware, data corruption, viruses, data infections or other harmful codes, hacking mechanisms, data crash codes and the like, by any third party or by any user, the INSaFLU team shall not be held liable for, including but not limited to, any liabilities, losses, loss of profits, data loss, damages, claims, costs and expenses (including legal fees) resulting from such circumstances. While providing us your e-mail upon log into INSaFLU, the INSaFLU team can contact you if you are experiencing any problems with your INSaFLU runs and inform you about INSaFLU updates. The user is entirely responsible for maintaining the confidentiality of his/her password and account and for all activities that occur under your account. The user agrees to notify the INSaFLU team immediately of any unauthorized use of his/her personal data or of any other breach of security that she/he becomes aware of. The INSaFLU team is not be liable for any loss that you may incur as a result of someone else using your personal account, either with or without your knowledge. The INSaFLU team reserves the right, solely for security reasons to suspend or delete a user account. The INSaFLU team will neither use any data submitted to INSaFLU for any purpose, nor claim ownership of any data stored by users in their personal space. The INSaFLU team will respect the privacy of the information stored in the private space of the users. The INSaFLU reserves the right to disable a query if it causing technical problems to its computational infrastructure. Such disabled queries will be reported to the users. Instituto Nacional de Saude (INSA) Doutor Ricardo Jorge, I.P.